Watch the Jesus Storybook Bible come to life. by Sally Lloyd-Jones et al. 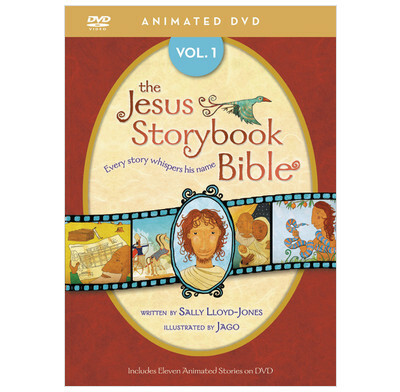 The award-winning Jesus Storybook Bible now comes to life as short animated videos. Narrated by actor David Suchet. Volume one DVD contains the first eleven stories from the Old Testament, starting with creation and ending with Moses and the parting of the Red Sea. Each episode whispers his name, sharing the story beneath all the stories in the Bible: the story of God's salvation plan through Jesus Christ. The Jesus Story Book Bible is an excellent accessible resource for children. The illustrations are bright and the story recounts are engaging. If you loved the Bible you will enjoy the DVD's. We've used the whole series in Church for our children's talk during the service. I bought the single copy for my grandson to watch excerpts from when he comes in from school and needs a bit of down time. They just point him in the right direction - to Jesus. The "Jesus Story Book Bible" from which the DVD is derived is a theological treasure for children and adults alike - the Gospel is at the heart of each story and Christ Jesus is revealed in His glorious, wonderous beauty at the climax of each narrative. All four DVDs are the same as the book, I could not recommend them highly enough. I bought two of these DVD's.. they were recommended b a friend..and I love them. I love the way that all the stories point to Jesus and show the large scale of God's plan for humanity. Great engaging stories and each a good length. I bought them to use for our low key Summer programme but actually they would make the basis of a great curriculum for Kids Church. We have now bought all 4 of these DVD's. Illustrations from the beautiful book are used and the narration lifted straight from the pages. It is simple and clear and well narrated by David Suchet. We have used it in small group settings, church and outreach events. Each short chapter with it's simple animation explains God's plan and points to Jesus. So much more than a Bible 'story' DVD.